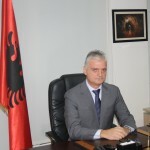 The US State Department, with the support of the US Embassy in Albania and in cooperation with the National Agency of Natural Resources (AKBN), started the second stage of training of specialists of this institution on April 9, 2019. The training, which lasted two days (9-10 April), is being held in the frame of the program for “Technical Assistance in Hydrocarbon Sector” and is fully supported by the Energy Bureau at the US State Department. The Executive Director of the National Agency of National Resources, Mr. Adrian Bylyku evaluated this training as very important saying “it is an extraordinary opportunity provided to AKBN specialists to get more knowledge of the hydrocarbon sector.” The Head of AKBN extended special thanks to the representative of the US State Department Office of Energy Programs, for the direct contribute and expertise provided during the concrete implementation of the project. The training focused on the production sharing contracts. The target of the training is the increase of the technical capacities with regard to the production sharing contracts and other sorts of agreements in the hydrocarbon sector. Further on the training dealt with the details of the analyzing of fiscal, economic and auditing terms, the settlement of disputes, the process of tendering in the case of production sharing contracts, the application of these contracts and the added agreements as well as the negotiating strategy of them. Deloitte is providing technical assistance to AKBN. This technical assistance is funded by the U.S. Department of State, Bureau of Energy Resources (ENR) and will support AKBN through three major activities: (i) Upstream Oil and Gas Tender Support; (ii) Hydrocarbon Sector Technical Oversight; and (iii) Technical Trainings. The implementation of this project at the National Agency of National Resources will last for an 18- month period.